Strictly speaking, much of what follows is not part of "history". But that's a story for another day. Do you know why which things aren't "history", and why? Different people believe different things. I understand much of what people who believe the Bible to be literal truth believe. In respect of where the earth, and plants and animals come from, I don't share their beliefs, but I have some grasp of what those beliefs are. I don't ask them to believe the alternative theory which scientists have developed, but I hope the fundamentalists will do me the courtesy of gaining some grasp of what I believe to be closer to "the truth" of the matter. This page attempts to set out a rough outline of some highlights of that theory. I must say: The Bible's explanation would be less work to recount. The problem with setting out science's view of "history" since The Beginning is the almost incomprehensible scale of the thing. Imagine you were a sentient termite, and lived all of your life inside the nest, underground, in a volume about 10m x 10 m x 5m... and then someone came along who wanted to get you to understand how big a mountain was. That would be trivial compared to trying to get a human to understand how long ago The Beginning was. We're going to go through those bars one at a time, but here's the broad picture of what they show. Each bar is a "picture" of a period of time. "Now" (approximately) is at the right hand end of the bar in every case. Now, for the moment, skip to the last bar, the bottom bar. That bar shows all of the roughly 14 billion years that science thinks have passed since "the Big Bang", which scientists think was "the beginning". So, for the top bar, we have "zoomed in" on a (relatively) short time period, and in the last bar, we've "stepped back" far enough to see everything there is to see; we're not "zoomed in" at all. The bars in between use "in between" degrees of zoom. And I've used the colors to show you how much the zoom level changes as you go from bar to bar. ARGH! I've just noticed that there is one small boo-boo in the coloring on the overview! Sorry. In general, everything is right. When we look at the bars one at a time, the coloring is right. Forgive me, if you spot the error? The first one goes from 0 A.D. (2,000 years ago) up to 2022, and is mostly cyan. So all of the first bar is part of the second bar. 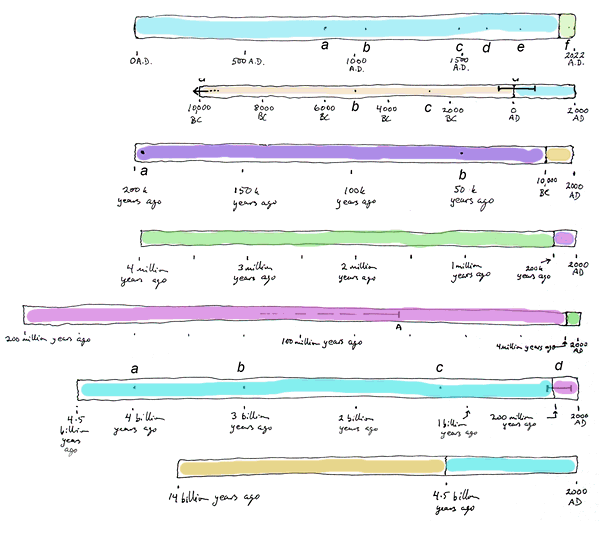 Notice that the right hand end of the second bar... the part for from 2,000 years ago up to 2022... is cyan. Not a coincidence! They cyan is showing you what part of the lower bar is duplicating what is in the upper bar. All of the bar pairs work the same way. The lower you are in the set of bars, the longer the period shown by the bar. Look back at the overview. In many cases as you go down the set of bars, the decrease in the "zoom factor" is quite large. That's why, for instance, the magenta bit at the right hand end of the penultimate bar is small. All of the bar above has been squeezed into that small bit of the penultimate bar. Now we're going to go through the bars, and I am going to show you when ("where"?) various important events took place. You may be surprised at the tiny part of the universe's "history" that it has taken to play out humanity's history, among other things. Great- great- great- great- great- great- great- great- great- great- great- great- great- great- great- great- great- great- great- great- great- great- great- great- great- great- great- great- great- great- great- great- great- great- great- great- great- great- great- great- great- great- great- great- great- great- great- great- great- great- great- great- great- great- great- great- great- great- great- great- great- great- great- great- great- great- great- great- great- great- great- great- great- great- great- great- great- great- great- great- great- great- great- great- great- great- great- great- great- great- great- great- great- great- great- great- great- great- great- great- great- grandfather would have been alive at the left hand end of this bar. And I'm arguing that this is a tiny drop in the ocean of "time since Big Bang". For the later bars, the scale means that the difference between 2022, 2012 and 2000 is insignificant. On this first bar, I elected to draw it out to 2022 because I am doing the description in 2012, and thought that life beyond ten years from now is sufficiently uncertain that I would not include those years here. And so we start to consider our second bar. This bar goes back to about the time that humankind "invented" agriculture, thus liberating society from a hunter gatherer existence. Don't forget, all of the material in the first bar is also in this second bar... but everything from the birth of Christ to the internet is now squashed into that small 8% at the right. D: The horizontal bar here shows the reign of the Western Roman Empire, and the Republic which preceded it. Are humans slow learners? What were "we" doing between 200,000 years ago and 50,000 years ago?? Here's one of those little mysteries which arise when you embark on something like this... In this particular stretch of time, I can think of nothing to tell you. A stretch of time neatly (and coincidentally!) equivalent to 2000 years for each of the 2000 years. I'm sure when I revisit this project, I will be able to find some geological events to insert. Onward! The 4 million years just passed, for us in 2012, are the tiny green square at the right hand end. "A" marks the end of the dinosaur's reign. The faint horizontal line, turning dotted as it proceeds to the left, back in time, The start of their time is before 4 million years ago. Recall that even if you count "man" as starting in 200,000 years ago... the dinosaurs will take some beating! Here we see the dinosaur's reign at a different scale! They are the small bar at the right, marked "d"
And so, finally, we come to the timeline that shows the whole span of time from the Big Bang to the present. Earth arose at 4.5 million years ago. I got up this morning at 4:30am, in order to see the 2012 transit of Venus. (It was cloudy, but, thank heavens, a brief break in the clouds gave me a glimpse of Venus in front of the sun.) I mention that as it is now 10pm, and I am a little tired. The 17 and a half hours I have been up... many of them spent on this and related matters... seem a long time. But, "long" is relative. One final little factoid for you. I recently saw an ad... not the most academically rigorous source of information, perhaps... but it claimed: "Of all the people who have ever reached the age of 65, three quarters of them are alive today." Thank you for persevering through this exploration of the almost unimaginable eons between the Big Bang and "now". I hope you enjoyed reading this as much as I enjoyed putting it together.